Relax and enjoy the views in cozy comfort as our powerful Snow Coach climbs almost 1,000 vertical feet to the first zip line departure deck. Look for possible wildlife as the driver points out areas of interest and gives commentary about the history of the area. (We reserve the right to use an optional shuttle if trail conditions are not appropriate for the snow cat. Our 6-1/2 ton military truck with 6 wheel drive, Polaris Rangers, and passenger vans provide safe and scenic transportation up the steep trails.) 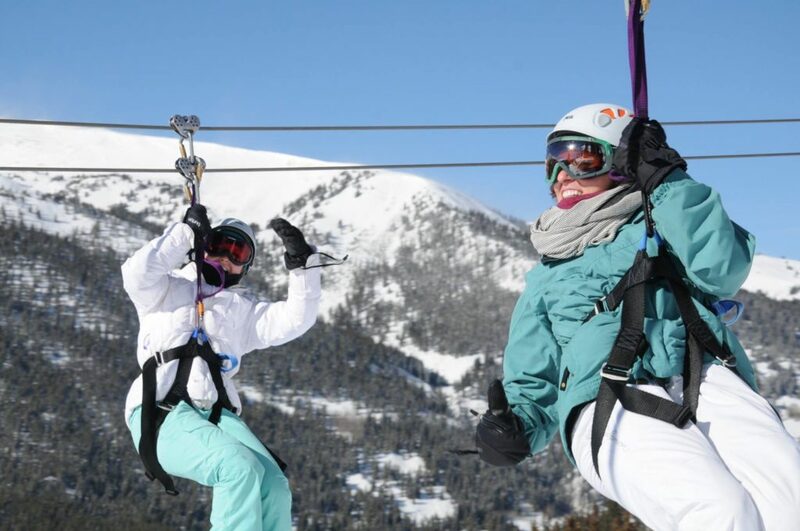 Our zip line guides are certified on the course and will accompany guests as they fly from area to area on lines from 400 to 850 feet, some with cables 300 feet off the ground. 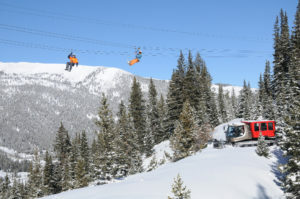 All six separate zip line sections have DOUBLE CABLES FOR SAFETY and distinctly different terrain. “Self-Braking is not required; we have an automatic braking system. Guests will soar on one single, side by side on TWIN LINES on four sections over dense pine forests, deep canyons and remote alpine meadows at ‘the top of the world’ then fly the BIG NUGGET ZIP, #6, and land on our 100’ Sky Tower. The Big Nugget is a TRIPLE ZIP. 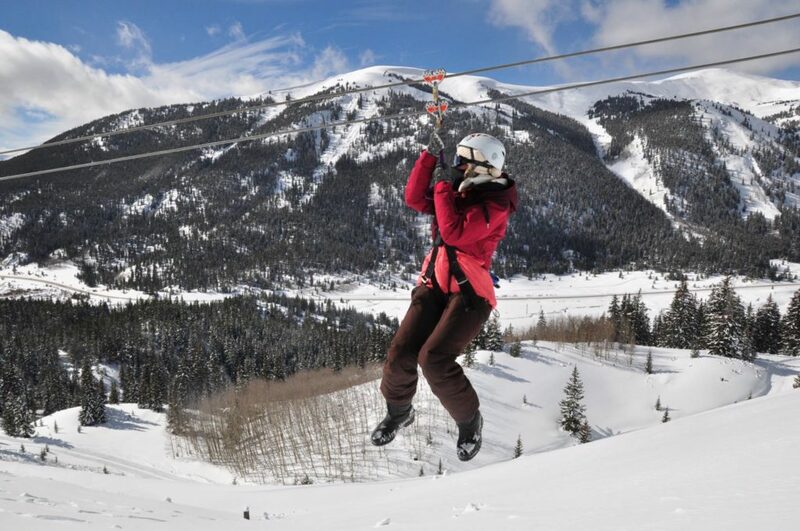 Our Zip Line is registered with the State of Colorado and was built and inspected according to the highest standards. Weight and age restrictions apply. Hot chocolate is provided. Free transportation is available from local hotels and condos. Helmets are mandatory and provided. Complimentary coveralls and boots are available if needed, but personal warm winter apparel is appropriate and recommended. Guests must bring goggles or sunglasses as eye protection is not provided. 9:00 a.m., 12:00 p.m., 3:00 p.m.